The Salmon our best-known Fish - Controversies and Anomalies - Food of Salmon - The Parr Controversy - Experiments by Shaw, Young, and Hogg - Grilse: its Rate of Growth - Do Salmon make Two Voyages to the Sea in each Year? - The Best Way of Marking Young Salmon. So many books have been written about this beautiful and valuable animal that I do not require to occupy a very large portion of my work with either its natural or economic history; for of the two hundred and fifty kinds of fish which inhabit the rivers and seas of Britain, the salmon (Solmo saler) is the one about which we know more than any other, and chiefly for these reasons :—It is of greater value as property than any other fish; its large size better admits of observation than smaller members of the fish tribe; and, in consequence of its migratory instinct, we have access to it at those seasons of its life when to observe its habits is the certain road to information. And yet, with all these advantages, or rather in consequence of them, there has been a vast amount of controversy, oral and written, as to the birth, breeding, and growth of the salmon. There have been controversies as to the impregnation of its eggs, as to the growth of the fish from the parr to the smolt stage; also as to the kind of food it eats, how long it remains in the salt water, and whether it makes one or two voyages to the sea per annum. There has likewise been a grilse controversy, as well as a rate-of-growth quarrel. These scientific and literary combats have been fought at intervals, and, to speak generally, have exhibited the temper and the learning of the combatants in about equal proportions. The dates of these controversies are not so easily fixed as might be desired, seeing that they are either scattered at intervals throughout the Transactions of learned societies, buried in heavy encyclopaedias, or altogether lost in the columns of newspapers. It is scarcely an exaggeration to say that during the past quarter of a century there has been a committee of inquiry either in the House of Lords and Commons, a royal commission, a blue book, or an Act of Parliament, every year on behalf of the salmon, besides several publications by private individuals. 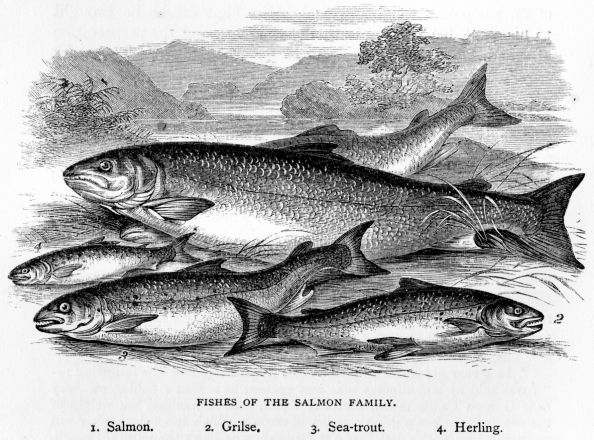 Although no person now believes the assertion of the Billings-gate naturalist, that salmon eggs come to maturity in a period of forty-eight hours, or that other authority who told the world that as soon as the fish burst from the ovum — a smolt six inches long coming out of a pea !—it was conducted to the sea by its parents, there is much of the romantic in the history of this monarch of the brook, and about the manner in which the varied disputed points have been solved, if indeed some of these points be yet completely settled. I shall not again enter into the impregnation theory, having said as much as was necessary about that portion of my subject in a previous division of this work, but proceed at once to give a summary of the parr controversy, and a few statements about the grilse and the full-grown fish as well. size of life, show the progress of the salmon during the first two years of its existence, at the end of which time it will, most likely, have changed into a smolt. After eating up its umbilical bag, which it takes a period of from twenty to forty days to accomplish, the young salmon may be seen about its birthplace, timid and weak, hiding among the stones, and always apparently of the same colour as the surroundings of its sheltering place. The transverse bars of the parr very early become apparent, and the fish begins to grow with considerable rapidity, especially if it is to be a twelvemonths’ smolt, and this is very speedily seen at such a good point of observation as the Stormontfield ponds. The smallest of the specimens given in the preceding page represents a parr at the age of two months; the next in size shows the same fish two months older; and the remaining fish is six months old. The young fish continue to grow for a little longer than two years before the whole number make the change from parr to smolt and seek the salt water. Half of the quantity of any one hatching however, begin to change at a little over twelve months from the date of their coming to life; and thus there is the extra ordinary anomaly, as I shall by and by show, of fish of the same hatching being at one and the same time parr of half-an-ounce in weight and grilse weighing four pounds. The smolts of the first year return from the sea whilst their brothers and sisters are timidly disporting in the breeding shallows of the upper streams, having no desire for change, and totally unable to endure the salt water, which would at once kill them. The sea-feeding must be favourable, and the condition of the fish well suited to the salt water, to ensure such rapid growth—a rapidity which every visit of the fish to the ocean serves but to confirm. Various fish, while in the grilse stage, have been marked to prove this; and at every migration they returned to their breeding stream with added weight and improved health. What the salmon feeds upon while in the salt water is not well known, as the digestion of that fish is so rapid as to prevent the discovery of food in their stomachs when they are captured and opened. Guesses have been made, and it is likely that these approximate to the truth; but the old story of the rapid voyage of the salmon to the North Pole and back again turns out, like the theory upon which was built up the herring-migration romance, to be a mere myth. None of our naturalists have yet attempted to elucidate that mystery of salmon life which converts one-half of the fish into sea-going smolts, while as yet the other moiety remain as parr. It has been investigated so far at the breeding-ponds at Stormontfield, but without resolving the question. There is another point of doubt as to salmon life which I shall also have a word to say about—namely, whether or not that fish makes two visits annually to the sea; likewise whether it be probable that a smolt remains in the salt water for nearly a year before it becomes a grilse. A salmon only stays, as it is popularly supposed, a very short time in the salt water, and as it is one of the quickest swimming fishes we have, it is able to reach a distant river in a very short space of time, therefore it is most desirable that we should know what it does with itself when it is not migrating from one water to the other; because, according to the opinion of some naturalists, it would speedily become so deteriorated in the river as to be unequal to the slightest exertion. The mere facts in the biography of the salmon are not very numerous; it is the fiction and mystery with which the life of this particular fish have been invested by those ignorant of its history that have made it a greater object of interest than it would otherwise have become. This will be obvious as I briefly trace the amount of controversy and state the arguments which have been expended on the three divisions of its life. of the fish with ova or milt in them. Dr. Knox, the anatomist, asserted that the parr was a hybrid belonging to no particular species of fish, but a mixture of many; and it is curious enough that although this fish was declared over and over again to be a separate species, no one ever found a female parr containing roe. The universal exclamation of naturalists for many a long year was always : It is a quite distinct species, and not the young of any larger fish. The above drawing represents a parr, the engraving being exactly half the size of life. This "distinct-species " dogma might have been still prevalent, had not the question been taken in hand and solved by practical men. Before mentioning the experiments of Shaw and Young, it will be curious to note the varieties of opinion which were evoked during the parr controversy, which has existed in one shape or another for something like two hundred years. As a proof of the difficulty of arriving at a correct conclusion amidst the conflict of evidence, I may cite the opinion of Yarrell, who held the parr to be a distinct fish. " That the parr," he says, "is not the young or the salmon, or, indeed, of any other of the large species of Salmonidae, as still considered by some, is sufficiently obvious, from the circumstance that parr by hundreds may be taken in the rivers all the summer, long after the fry of the year of the larger migratory species have gone down to the sea." Mr. Yarrell also says, "The smolt or young salmon is by the fishermen of some rivers called ‘a laspring;’" and explains, "The laspring of some rivers is the young of the true salmon; but in others, as I know from having had specimens sent me, the laspring is really only a parr." Mr. Yarrell further states the prevalence of an opinion "that parrs were hybrids, and all of them males." Many gentlemen who would not admit that parr were salmon in their first stage have lived to change their opinion. The first person who "took a thought about the matter"— i.e., as to whether the parr was or was not the young of the salmon—and arrived at a solid conclusion, was James Hogg, the Ettrick Shepherd, who, in his usual impulsive way, proceeded to verify his opinions. He had, while herding sheep, many opportunities of watching the fishing-streams, and, like most of his class, he wielded his fishing-rod with considerable dexterity. While angling in the tributaries of some of the Border salmon-streams he had often caught the parr as it was changing into the smolt, and had, after close observation, come to the conclusion that the little parr was none other than the infant salmon. Mr. Hogg did not keep his discovery a secret, and the more his facts were controverted by the naturalists of the day the louder became his proclamations. He had suspected all his life that parr were salmon in their first stage. He would catch a parr with a few straggling scales upon it; he would look at this fish and think it queer; instantly he would catch another a little better covered with silver scales, but all loose, and not adhering to the body. Again he would catch a smolt, manifestly a smolt, all covered with the white silver scales, yet still rather loose upon its skin, which would come off in his hand. Removing these scales he found the parr, with the blue finger-marks below them, and that the fish were young salmon then became as manifest to the Shepherd as that a lamb, if suffered to live, would become a sheep. Wondering at this, he marked a great number of the lesser fish, and offered rewards (characteristically enough of whisky) to the peasantry to bring him such as had evidently undergone the change predicted by him. Whenever this conclusion was settled in his mind, the Shepherd at once proclaimed his new-gained knowledge. "What will the fishermen of Scotland think," said he, "when I assure them, on the faith of long experience and observation, and on the word of one who can have no interest in instilling an untruth into their minds, that every insignificant parr with which the Cockney fisher fills his basket is a salmon lost." These crude attempts of the impulsive shepherd of Ettrick - and he was hotly opposed by the late Mr. Burst of Stormontfield - were not without their fruits; indeed they were so successful as quite to convince him that parr were young salmon in their first stage. Shepherd - "I maintain that ilka saumon comes aye back again frae the sea till spawn in its ain water." Friend - "Toots, toots, Jamie ! hoo can it manage till do that ? hoo, in the name o' wonder, can a fish, travelling up a turbid water frae the sea, know when it reaches the entrance to its birthplace, or that it has arrived at the tribituary that was its cradle!" Shepherd - "Man, the great wonder to me is no hoo the fish get back, but hoo they find their way till the sea first ava, seein' that they've never been there afore !" The parr question, however, was determined in a rather more formal mode than that adopted by the author of "Bonny Kilmenny." The late Mr. Shaw, a forester in the employment of the Duke of Buccleuch, took up the case of the parr in 1833, and succeeded in solving the problem. In order that he might watch the progressive growth of the parr, Mr. Shaw began by capturing seven of these little fishes on the 11th of July 1833 ; these he placed in a pond supplied by a stream of excellent water, where they grew and flourished apace till early in April 183-1, between which date and the 17th of the following May they became smolts ; and all who saw them on that day when they were caught by Mr. Shaw were thoroughly convinced that they were true salmon smolts. In March 1835 Mr. Shaw repeated his experiments with twelve parrs of a larger size, taken also from the river. On being transferred to the pond, these so speedily acquired the scales of the smolt that Mr. Shaw assumed a period of two years as being the time at which the change took place from the parr to the smolt. The late Mr. Young of Invershin, a well-known authority on salmon life, was experimenting at the same time as Mr. Shaw, and for the same purpose-namely, to determine if parr were young salmon, and, if so, at what period they became smolts and proceeded to the sea. Mr. Shaw said two years, and Mr. Young, who was then manager of the Duke of Sutherland's fisheries, said the change took place in twelve months; others, again, who took an interest in the controversy, said that three years elapsed before the change was made. The various parties interested held each their own opinion, and it may even be said that the disputation still goes on; for although a numerous array of facts bearing on the migration have been gathered, we are still in ignorance of any regulating principle on which the migratory change is based, or to account for the impulse which impels a brood of fish to proceed to sea divided into two moieties. Mr. Shaw watched his young fry with unceasing care, and described their growth with great minuteness, for a period extending over two years, when his parrs became smolts. Mr. Young, in a letter from Invershin, dated January 1853, says, pointedly enough - "The fry remain in the river one whole year, from the time they are hatched to the time they assume their silvery coat and take their first departure for the sea. All the experiments we have made on the ova and fry of the salmon have exactly corresponded to the same effects, and none of them have taken longer in arriving at the smolt than the first year." The late Mr. Burst, in one of his letters on the progress of artificial breeding at the Stormontfield ponds, says: "There is at present a mystery as regards the progress of the young salmon. There can be no doubt that all in our ponds are really and truly the offspring of salmon; no other fish, not even the seed of them, could by any possibility get into the ponds. Now we see that about one half have gone off as smolts, returning in their season as grilses; the other half remain as parrs, and the milt in the males is as much developed, in proportion to the size of the fish, as their brethren of the same age seven to ten pounds weight, whilst these same parrs in the ponds do not exceed one ounce in weight. This is an anomaly in nature which I fear cannot be cleared up at present. I hope, however, by proper attention, some light may be thrown upon it from our experiments next spring. The female parrs in the pond have their ova so undeveloped that the granulations can scarcely be discovered by a lens of some power. It is strange that both Young's and Shaw's theories are likely to prove correct, though seemingly so contradictory, and the much-disputed point settled, that parrs (such as ours at least) are truly the young of the salmon." It is quite certain that parr are young salmon, and that a parr becomes a smolt and goes to the sea, although there are still to be found, no doubt, a few wrong-headed people who refuse to be convinced on the point, but pridefully maintain all the old salmon theories and prejudices. With them the parr is still a distinct fish, the smolt is the true young of Salmo salar in its first stage, and a grilse is just a grilse and nothing more. However, these old-world people will in time pass away (there is no hope of converting them), and then the modern views of salmon biography, founded as they are on laborious personal investigation, will ultimately prevail. The Smolt and Grilse. - But the great parr mystery is still unsolved-that is to say, no one knows on what principle the transformation is accomplished ; why it is that only half of a brood ripen into smolts at the end of a year, the other moiety taking double that period to arrive at the same stage of progress. Some scientific visitors to the Stormontfield ponds say that this anomaly is natural enough, and that similar ratios of growth may be observed among all animals ; but it is curious that just exactly the half of a brood-and the eggs, be it remembered, all from adult salmon, and therefore similar in ripeness and other conditions-should change into smolts at 'the end of a year, leaving a moiety in the ponds as parr for another twelvemonth. The most remarkable phase in the life of the salmon is its extraordinary instinct for change. After the parr has become a smolt, it is found that the desire to visit the sea is so intense, especially in pond-bred fish, as to cause them to leap from their place of confinement, in the hope of attaining at once their salt-water goal ; and of course the instinct of river-bred fish is equally strong on this point-they all rush to the sea at their proper season. There are various opinions as to the cause of this migratory instinct in the salmon. Some people say it finds in the sea those rich feeding-grounds which enable it to add so rapidly to its weight. It is quite certain that the fish attains its primest condition while it is in the salt water; those caught in the estuaries by means of stake or bag nets being richer in quality and finer in flavour than the river fish : the moment the salmon enters the fresh water it begins to decrease in weight and fall from its high condition. It is a curious fact, and a wise provision of nature, that the eel, which is also a migratory fish, descends to spawn in the sea as the salmon is ascending to the river-head for the same purpose ; were the fact different, and both fish to spawn in the river, the roe of the salmon would be completely eaten up. In due time then, we find the silver-coated host leaving the rippling cradle of its birth, and adventuring on the more powerful stream, by which it is borne to the sea-fed estuary, or the briny ocean itself. And this picturesque tour is repeated year after year, being apparently the grand essential of salmon life. village meadow, and as it rolls ceaselessly ocean-ward, giving a more picturesque aspect to the quaint agricultural villages and farm homesteads which it passes in its course. During the whole length of its pilgrimage the army of smolts pays a tribute to its enemies in gradual decimation : it is attacked at every point of vantage ; at one place the smolts are taken prisoners by the hundred in some well-contrived net, at another picked off singly by some juvenile angler. The smolt is greedily devoured by the trout, the pike, and various other enemies, which lie constantly in waiting for it, sure of a rich feast at this annually-recurring migration. But the giant and fierce battle which this infantile tribe has to fight is at the point where the salt water begins to mingle with the stream, where are assembled hosts of greedy monsters of the deep of all shapes and sizes, from the porpoise and seal down to the young coal-fish, who dart with inconceivable rapidity upon the defenceless shoal, and play havoc with the numbers. Many naturalists dispute most lustily the assertion that the smolt returns to the parental waters as a grilse the same year that it visits the sea ; and some writers have maintained that the young fish makes a grand tour to the North Pole before it makes up its mind to " hark back." It has been pretty well proved, however, that the grilse may have been the young smolt of the same year. A most remarkable fact in the history of grilse is, that we kill them in thousands before they have an opportunity of perpetuating their kind ; indeed on some rivers the annual slaughter of grilse is so enormous as palpably to affect the " takes " of the big fish. It has been asserted, likewise, that the grilse is a distinct fish, and not the young of the salmon in its early stage.' There has been a controversy as to the rate at which the salmon increases in weight ; and there have been numerous disputes about what its instinct had taught it to " eat, drink, and avoid." It has been authoritatively settled, however, that grilse become salmon ; and, notwithstanding a recent opening up of this old sore, I hold the experiments conducted by his Grace the Duke of Athole and the late Mr. Young of Invershin to be quite conclusive. The latter gentleman, in his little work on the salmon, after alluding to various points in the growth of the fish, says-" My next attempt was to ascertain the rate of their growth during their short stay in salt water, and for this purpose we marked spawned grilses, as near as we could get to four pounds weight ; these we had no trouble in getting with a net in the pools below the spawning-beds, where they had congregated together to rest, after the fatigues of depositing their seed. All the fish above four pounds weight, as well as any under that size, were returned to the river unmarked, and the others marked by inserting copper wire rings into certain parts of their fins : this was done in a manner so as not to interrupt the fish in their swimming operations, nor be troublesome to them in any way. After their journey to sea and back again, we found that the four-pound grilses had grown into beautiful salmon, varying from nine to fourteen pounds weight. I repeated this experiment for several years, and on the whole found the results the same, and, as in the former marking, found the majority returning in about eight weeks; and we have never among our markings found a marked grilse go to sea and return a grilse, for they have invariably returned salmon." The late Duke of Athole took considerable interest in the grilse question, and kept a complete record of all the fish that he had caused to be marked ; and in his Journal there is a striking instance of rapidity of growth. A fish marked by his Grace was caught at a place forty miles distant from the sea; it travelled to the salt water, fed, and returned in the short space of thirty-seven days. The following is his entry regarding this particular fish:- "On referring to my Journal, I find that I caught this fish as a kelt this year, on the 31st of March, with the rod, about two miles above Dunkeld Bridge, at which time it weighed exactly ten pounds; so that, in the short space of five weeks and two days, it had gained the almost incredible increase of eleven pounds and a quarter ; for, when weighed here on its arrival, it was twenty-one pounds and a quarter." There could be no doubt, Mr. Young thinks, of the accuracy of this statement, for his Grace was most correct in his observations, having tickets made for the purpose, and numbered from one upwards, and the number and date appertaining to each fish was carefully registered for reference. As the fish grew so rapidly during their visit to the salt water, people began to wonder what they fed on, and where they went. A hypothesis was started of their visiting the North Pole ; but it was certain, from the short duration of their visit to the salt water that they could proceed to no great distance from the mouth of the river which admitted them to the sea. Hundreds of fish were dissected in order to ascertain what they fed upon ; but only on very rare occasions could any traces of food be found in their stomachs. What, then, do salmon live upon? was asked. It is quite clear that salmon obtain in the sea some kind of food for which they have a peculiar liking, and upon which they rapidly grow fat; and it is very well known that after they return to the fresh water they begin to lose flesh and fall off in condition. The rapid growth of the fish seems to imply that its digestion must be rapid, and may perhaps account for food never being in its stomach when found; although I am bound to mention that one gentleman who writes on this subject accounts for the emptiness of the stomach by asserting that salmon vomit at the moment of being taken. The codfish again is frequently found with its stomach crowded; in fact, I have seen the stomach of a large cod which formed quite a small museum, having a large variety of articles "on board," as the fisherman said who caught it. It is supposed by some writers that salmon make two voyages in each year to the sea, and this is quite possible, as we may judge from data already given on this point; but sometimes the salmon, although it can swim with great rapidity, takes many weeks to accomplish its journey, because of the state of the river. If there be not sufficient water to flood the course, the fish must remain in various pools till the state of the water admits of their proceeding on their journey either to or from the sea. The salmon, like all other fish, is faithful to its old haunts; and it is known, in cases where more than one salmon-stream falls into the same firth, that the fish of one stream will not enter another, and where the stream has various tributaries suitable for breeding purposes, the fish breeding in a particular tributary invariably return to it. But, in reference to the idea of a double visit to the salt water, may we not ask-particularly as we have the dates of marked fish for our guidance-what a salmon that is known to be only five weeks away on its sea visit does with itself the rest of the year ? A salmon, for instance, spawning about "the den of Airlie," on the Isla, some way beyond Perth, has not to make a very long journey before it reaches the salt water, and travelling at a rapid rate would soon accomplish it; but supposing the fish took thirty days for its passage there and back, and allowing a period of four weeks for spawning and rest, there are still many months of its annual life unaccounted for. It cannot remain in the river forty-seven weeks, because it would become so low in condition from the want of a proper supply of nourishing food that it would die; and it is this fact that has led to the supposition of a double journey to the sea. The Rev. Dugald Williamson, who wrote a pamphlet on this subject, entertains no doubt about the double journey. "Salmon migrate twice in the course of the year, and the instinct which drives them from the sea in summer impels them to the sea in spring. Let the vernal direction of the propensity be opposed, let a salmon be seized as it descends and confined in a fresh-water pond or lake, and what is its fate? Before preparing to quit the river it had suffered severely in strength, bulk, and general health, and, imprisoned in an atmosphere which had become unwholesome, it soon begins to languish, and in the course of the season expires : the experiment has been tried, and the result is well known. This being an ascertained and unquestionable fact, is it a violent or unfair inference that a similar result obtains in the case of those salmon that are forced back, from whatever cause, to the sea, that the salt-water element is as fatal to the pregnant fish of autumn as the fresh-water element is to the spent fish in spring? . . . If there is any truth in these conjectures, they suggest the most powerful reasons for resisting or removing obstructions in the estuary of a river." The riddle of this double migration of the salmon is likely still to puzzle us. It is said that the impelling force of the migratory instinct is, that the fish is preyed upon in the salt water by a species of crustaceous insect, which forces it to seek the fresh waters of its native river; again that while the fresh water destroys these sea-lice a parasite infests it in the river, thus necessitating its return to the sea. My own experience leads me to believe that salmon can exist in the fresh water for a considerable time, and suffer but little deterioration in weight, but they never, so far as I could ascertain, grow while in the fresh streams. It is a well-known fact that parr cannot live in salt water. I have both tried the experiment myself and seen it tried by others; the parr invariably die when placed in contact with the sea-water. Mr. William Brown, in his painstaking account of The Natural History of the Salmon, also bears his testimony on this part of the salmon question:- "Until the parr takes on the smolt scales, it shows no inclination to leave the fresh water. It cannot live in salt water. This fact was put to the test at the ponds, by placing some parrs in salt water-the water being brought fresh from the sea at Carnoustie; and immediately on being immersed in it the fish appeared distressed, the fins standing stiff out, the parr-marks becoming a brilliant ultramarine colour, and the belly and sides of a bright orange. The water was often renewed, but they all died, the last that died living nearly five hours. After being an hour in the salt water, they appeared very weak and unable to rise from the bottom of the vessel which contained them, the body of the fish swelling to a considerable extent. This change of colour in the fish could not be attributed to the colour of the vessel which held them, for on being taken out they still retained the same brilliant colours." All controversies relating to the growth of salmon may now be held as settled. It has been proved that the parr is the young of the salmon; the various changes which it undergoes during its growth have been ascertained, and the increase of bulk and weight which accrues in a given period is now well understood. But we still require much information as to the "habits" of fish of the salmon kind. In a recent conversation with Air Marshall of Stormontfield, while comparing notes on some of the disputed points of salmon growth, we both came to the conclusion that the following dates, founded on the experiments conducted at Stormontfield, might be taken as marking the chief stages in the life of a salmon. An egg deposited in the breeding-boxes in December 1869 yielded a fish in April 1870 ; that fish remained as a parr till a little later than the same period of 1871, when, being seized with its migratory instinct, and having upon it the protecting scales of the smolt, it departed from the pond into the river Tay on its way to the sea, having previously had conferred upon it a certain mark by which it could be known if recaptured on its return. It was recaptured as a grilse within less than three months of its departure (July), and weighed about four pounds. Being marked once more, it was again sent away to endure the dangers of the deep; and lo I was once more taken, this time a salmon of the goodly weight of ten pounds ! But there comes in here the question if it was the same fish, for it is said that the smolt in some cases remains a whole winter in the sea, and therefore that the fish I have been alluding to was a smolt that had never come back as a grilse. I have a theory that half of the brood of smolts sent to sea do remain over the winter and come back as salmon, while the others come back almost immediately as grilse. It is possible, however, that any particular fish may lose its river for a season, and be in some other water for a time as a grilse, and then finding its birth-stream come once again to its " procreant cradle." The rapidity of salmongrowth, however, I consider to be undoubtedly proved. A good deal has been said in various quarters about the best way of marking a young salmon, so that at some future stage of its life it may be easily identified. Cutting off the dead fin is not thought a good plan of marking, because such a mark may be accidentally imitated, and so mislead those interested, or it may be wilfully imitated by persons wishing to mislead. Of the smolts sent away from the Stormontfield ponds during May 1855, 1300 were marked in a rather common way - viz. by cutting off the second dorsal fin-and twenty-two of these marked fish were taken as grilse during that same summer, the first being caught on the 7th of July, when it weighed three pounds. The late Mr. Buist, who took charge of the experiments, was quite convinced that a much larger number of the marked fish than twenty-two was caught, but many of the fishermen, having an aversion to the system of pond-breeding, took no pains to discover whether or not the grilse they caught had the pond-mark, and so the chance of still further verifying the rate of salmon growth was lost. A reward offered by Mr. Buist of 2s. per pound weight for each grilse that might be brought to his office, led to an imitation of the mark and the perpetration of several petty frauds in order to get the money. The mark was frequently imitated, and one or two fish were brought to Mr. Buist which almost deceived him into the belief of their being some of the real marked fish. As Mr. Buist said - " So cunningly had this deception been gone about, that a casual observer might have been deceived. When the fin was cut off the recent wound was far too palpable ; and to hide this the man cut a piece of skin from another fish and fixed it upon the wounded part. I examined this fish, which was lying alongside of an undoubted pond-marked fish, which had the skin and scales grown over the cut, and I am satisfied that it would be impossible to imitate the true mark by any process except by marking the fish while young." [In a very old number of the Scots Magazine I find the following :" I was told by a gentleman who was present at a boat's fishing on Spey near Gordon Castle in the month of April, that in hauling, the weight of the net brought out a great number of smouts which the fishers were not willing to part with ; but that a gentleman, who knew the natural propensity of the salmon to return to their native river, persuaded them to slip them back again into the water, assuring them that in two months they would catch most of them full-grown grilses, which would be of much greater value. He at the same time laid a bet of five guineas with another gentleman present, who was somewhat dubious, that he should not fail in his prediction. The fishers agreed. He accordingly clipt off a part of the tail-fins from a number of them before he dropped them into the river ; and within the time limited the fishers actually caught upwards of a hundred grilses thus marked, and soon after many more." ] Peter Marshall, the intelligent keeper of the ponds, agrees with me in saying that the number of fish taken, each being minus the dead fin, was a sufficient proof that these fish were really the pond-bred ones returned as grilse. It is impossible that twenty or thirty grilse could have all been accidentally maimed within a few weeks, and each present the same—the very same appearance. Various other plans of marking were tried by the authorities at Stormontfield, some of which were partially successful, and added another link to the chain of evidence, which proves at any rate that many individual fish have grown from the smolt to the grilse state in the course of a very few weeks.